The 1948 Constitution of the Republic of Korea (South Korea), as amended, recognises that it is a duty of the state to "confirm and guarantee the fundamental and inviolable human rights of individuals".Art. 10, 1948 Constitution of the Republic of Korea.The Constitution does not explicitly protect the right to life though it is specified that "No citizens shall be tortured...."Art. 12(2), 1948 Constitution of the Republic of Korea. The Constitution refers obliquely to the police, stipulating that the relatives of a police officer killed in the line of duty shall not be entitled to claim damages against the state but does not otherwise refer to a police force or the rules governing use of force by law enforcement agencies. There is no regional Asian human rights treaty to which South Korea could become party. The Combat Police division of the National Police Agency, which is composed of military conscripts, is an anti-riot paramilitary unit. The use of lethal police equipment shall be restricted to the necessary minimum.Art. 10(4), 2017 Act on the Performance of Duties by Police Officers. This does not comply with international law and standards, which restrict the use of firearms to situations of imminent threat of death or serious injury or a proximate and grave threat to life. The National Human Rights Commission of Korea has the power to hear complaints of excessive or indiscriminate use of force by the police, though in 2017, in its Concluding Observations, the Committee against Torture expressed concern about the Commission's "low rate of acceptance of complaints relating to torture or ill-treatment". about the severe restrictions placed on the right to peaceful assembly, including the operation of a de facto system of authorization of peaceful assemblies by the police, cases of use of excessive force, car and bus blockades, and the restriction on demonstrations held past midnight. It is also concerned about the frequent application of criminal law to impose fines on and arrest journalists and human rights defenders for either organizing or participating in protests without due consideration for their right to freedom of assembly.Human Rights Committee, Concluding Observations on South Korea, UN doc. CCPR/C/KOR/CO/4, 2015, para. 52. The Committee called on South Korea to "ensure that all persons enjoy the right to peaceful assembly, and that limitations on that right are in strict compliance with article 21 of the Covenant. It should review its regulations on the use of force and ensure that they are in compliance with the Covenant, and train its police officials accordingly. "Human Rights Committee, Concluding Observations on South Korea, UN doc. CCPR/C/KOR/CO/4, 2015, para. 53. (d) The reported excessive use of force, including the firing of water cannons and use of pepper spray (capsaicin) against the families bereaved by the Sewol Ferry accident during the one-year memorial assembly.Committee against Torture, Concluding Observations on South Korea, UN doc. CAT/C/KOR/CO/3-5, 2017, para. 13. (f) Provide all victims of excessive use of force by law enforcement officials with access to medical services, counselling and redress, including rehabilitation and compensation.Committee against Torture, Concluding Observations on South Korea, UN doc. CAT/C/KOR/CO/3-5, 2017, para. 14. 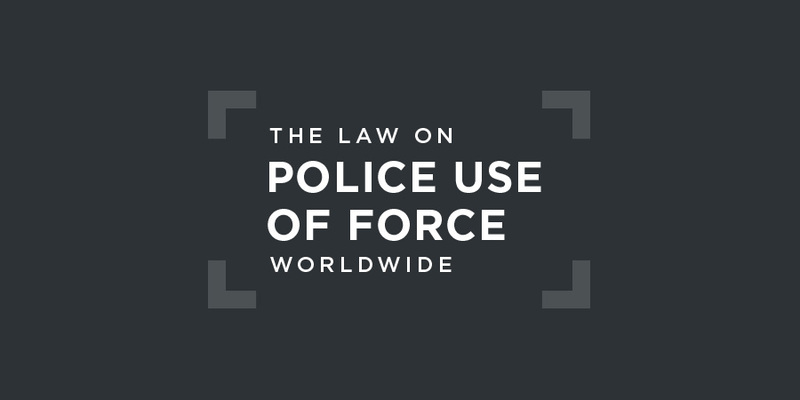 There is no regional human rights court with jurisdiction to review police use of force in South Korea. In June 2018, Amnesty International called for laws and regulations related to the policing of demonstrations to be "promptly amended to meet international law and standards". The call followed the decision of the Seoul District Court to only fine Shin Yoon-gyoon, the former chief of Seoul's fourth riot battalion, and two other South Korean police officers despite being convicted of neglect of duty in connection with the death of Baek Nam-gi, a farmer who sustained fatal injuries after being hit by a water cannon during a protest in 2015. Baek Nam-gi was struck unconscious by a police water cannon during anti-government protests in Seoul on 14 November 2015. He fell into a coma and eventually died from his injuries in hospital on 25 September 2016, aged 68. The way in which water cannons were used violated South Korean police guidelines being operated at too close a distance and at too high a strength and was aimed in a manner that struck the head of Baek Nam-gi. Video footage shows police continuing to direct the water cannon at his limp body as other protesters attempted to drag him away. The Korean National Police Agency has since made the decision to adopt measures to better guarantee the right of peaceful assembly, as recommended by the country's Police Reform Committee, but the proposed changes have yet to be put into legislation.